Cao and Chen Aisen won the men's 10 metres synchro platform as they scored 494.55, beating Aleksandr Bondar and Viktor Minibaev of Russia, who totalled 425.67, and Domonic Bedggood and Declan Stacey of Australia, who scored 411.00. Britain's Tom Daley and Matthew Lee were fourth on 400.86. Cao, who won his Olympic titles in the 10m platform synchro at London 2012 and the 3m springboard at Rio 2016, stood on top of the podium of the 3m springboard synchro later in the evening session with Xie Siyi. Their total of 469.08 points left them well ahead of the runners-up, Jahir Ocampo and Rommel Pacheco of Mexico, who totalled 413.61, and Philippe Gagne and Francois Imbeau-Dulac of Canada, who scored 399.48. "I made some minor mistakes in the forward and backward dives, but did a good job in the next four routines," Cao said. "It is a special pressure competing the synchro because I don't want to drag my partners down. "I try to stay in tune with the pace of each partner, while I just need to concentrate on my own in the individual." Daniel Goodfellow and Jack Laugher of Britain were second in the 3m synchro after five dives but made a big mistake in their last dive and received no points for it. Daley, meanwhile, was not totally satisfied with his 10m platform synchro performance. "It was not a great battle today, but we were better than we were in the last leg in Japan," he said. "We did 387.93 in the last event and today we took 400.86 points. "Matthew and I are quite a new pair - we have been training together for only four months. "Every new competition is a learning opportunity. "I believe we will get better after we compete in the next legs in Montreal, Kazan and London. "Our ultimate goal is the World Championships." Zhang Jiaqi, gold medallist in last year's World Cup, claimed victory in her trademark event of the 10m synchro platform with a new partner, Lu Wei, winning with 354.06 points. Kim A Rim and Kim Mi Rae of North Korea came second with 325.80 and Meaghan Benfeito and Caeli McKay of Canada were third on 313.44. "I still felt very nervous but I tried to calm down since I am a bit more experienced than my new partner Lu," said Zhang. "It is our second time competing together, we should boost each other." 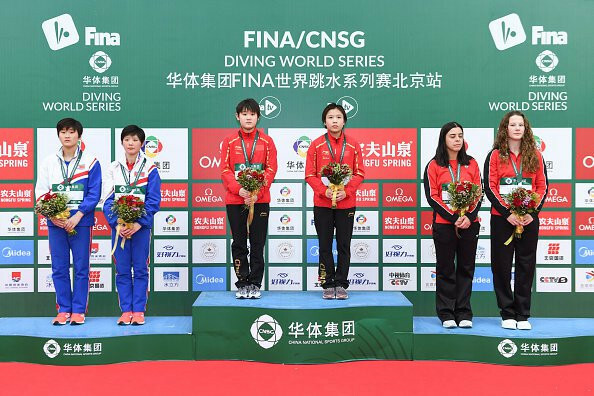 Shi Tingmao and Wang Han ruled the women's 3m springboard with 339.30 points, in front of Maddison Keeney and Anabelle Smith of Australia, who took silver with 300.93. Grace Reid and Katherine Torrance of Britain closed the podium. A total of 78 elite divers from 14 countries are taking part in the second leg of the Diving World Series 2019 which is running until Saturday (March 9).